Konami's innovative new Wii game coming in mid-December. 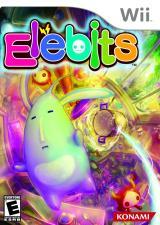 November 8, 2006 - Although Konami previously announced that it intended to debut its quirky and innovative new Wii title Elebits during the system's "launch window," it never offered up a firm date. But a spokesperson for the company confirmed today that the game would ship either December 12 or December 18 depending on whether or not Nintendo approves its latest build submission. The title is more or less complete, but it cannot go into manufacturing until it is evaluated and approved by the ever-watchful quality detectives at Nintendo of America. Elebits thrusts players into a first-person view and challenges them to use a capture beam device, which can manipulate gravity, to find hidden creatures called Elebits scattered around 3D kitchens, living rooms, backyards and neighborhoods. The title uses complex physics to simulate real-world weight so that each object in the game has different beam attributes. IGN Wii will have much more on Elebits in the coming weeks. Stay tuned. The art of Elebits is amazing! Props to whoever designed them. Who's hyped for this game? Anybody? Access content on your cell. Apple Getting Into the Game?